Another Secret Recipe Club Monday! If you’ve missed past SRC posts, the premise is this: you’re assigned a different member’s blog every month. 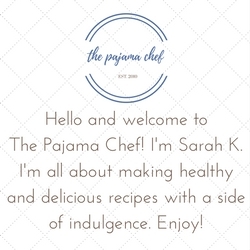 You visit their blog, choose any recipe you want, then make it and share it on your blog. Everyone else posts about their secret blog the same day. 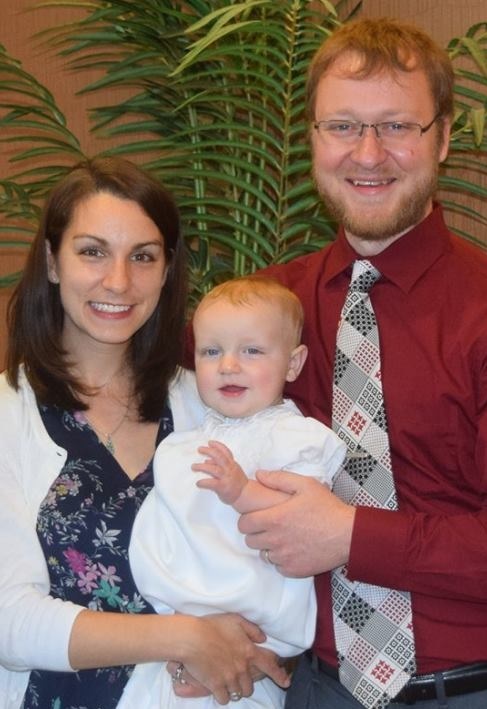 It’s fabulously fun to try out new blogs. If you have a blog, definitely check it out and consider joining! I highly recommend it. For the month of August, I was assigned Cooking Rookie, who blogs over at Cook Book of Trial and Error. This blog is full of enticing recipes and beautiful photography so definitely check it out if you have a chance. 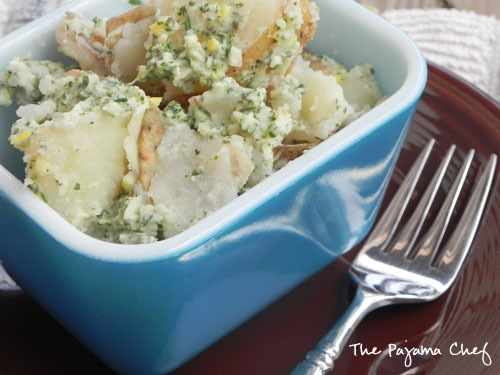 I had a hard time deciding what recipe to try, but when I saw this scrumptious Pesto Potato Salad, I was sold. My herbs on the balcony are growing out of control, and this seemed like a delightful way to use some of them up. And let me tell you… it was as delicious as it was delightful! Cooking Rookie’s original pesto was composed of cilantro, walnut, and lemon… but I decided to use some of my abundant pineapple sage instead of cilantro. 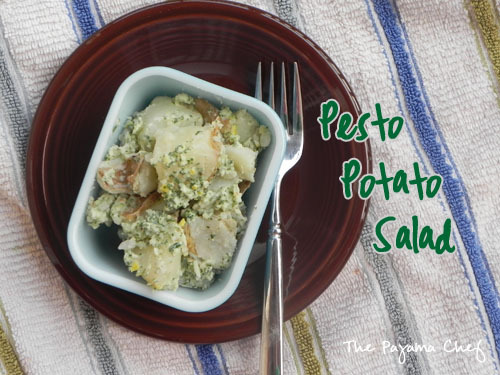 I kept everything else the same, though… including the unique addition of plain yogurt to make this pesto potato salad both creamy and fresh. I usually make my potato salad with mayo, but might have to rethink that, because plain yogurt definitely produces a refreshing tang like mayo while being a little healthier. This isn’t to say in my normal potato salad I’ll replace the mayo entirely, but I can see a little half-and-half combo going on. Bring a large pot of water to a boil and then add potatoes. Cook for about 20 minutes, or until potatoes can be easily pierced with a fork. Meanwhile, place sage, walnuts, lemon zest and juice [or 1/2 a lemon if you’re lazy like me], and garlic in a food processor. Pulse until everything is well combined, then add yogurt, as well as freshly ground black pepper to taste. After potatoes are prepared, place in a bowl. Toss pesto with potatoes and serve warm or cold. Enjoy your day by checking out other great SRC recipes! 🙂 I know I will be! I love how this potato salad is spiced up with pesto! I am ridiculously in love with pesto and I’ve never even though about adding it to a potato salad. Sounds amazing. And yes, we’re a bit in Olympic overload at the moment as well! I get it! thanks nicole! pesto is so good but i usually only eat it on pasta or sandwiches, so this was new to me too! I love pesto with walnuts. This looks delicious! this was my first time having pesto with walnuts… and it definitely will not be my last! Walnuts in a potato salad is a great idea. More crunch. I have never done that but I am willing to give it a go. Wow, this is pretty funny that we had each other’s blogs 🙂 Looks like we share the same love for potatoes! I love your variation using sage. And your pics are so pretty! Glad that you liked my recipe. I definitely loved your potato skins! thanks! this recipe was genius! Sage pesto in the potato salad sounds wonderful, great SRC pick. If you haven’t already, I’d love for you to check out my SRC entry: Chicken Satay Noodle Salad. I had to, you’re one of my favs! awww, that’s so sweet! thanks! i’ll check it out tonight! This is so different from any potato salad I’ve ever tried but it sounds FABULOUS! This looks great! I’ve made a ton of different pestos over time but have never used sage. Which is weird since I have a TON of it growing outside. It goes so perfectly with potatoes so this makes a lot of sense. I think I know what I’m making this evening! I love twists on traditional potato salad, they are always better than the original versions in my opinion! Mmm, awesome summer flavors are happening here!